I’m not a great fan of blonde beers. An early incident with Leffe when I was a lad has put me off for life. But, this is a local brewery and a beer I wanted to try it. Anyway, it’s alright. Much much nicer than Leffe. It’s got a nice long lasting head, and golden colour. Smells honey like and a hint of butter with a citrusy finish. 4.5% from a 500ml bottle. 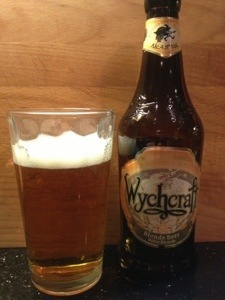 This entry was posted in beers and tagged blonde, wychcraft, wychwood. Bookmark the permalink.